A language-neutral specification for 1) capturing, and 2) rendering, structured log events in a format that’s both human-friendly and machine-readable. This document explains the reasons message templates are used, and provides a specification of their syntax, capturing behavior, and rendering behavior, to assist in creating implementations for various programming languages and logging interfaces. Early application logging, or printf debugging, produced a stream of text describing the events taking place within an application. This worked well for simple applications running on a single computer, and over the years many tools evolved to help support this format in ever-more-complex, and ever-more-distributed applications. Log parsing can extract most of the relevant information from the event above, but considerable effort is required for non-trivial diagnostic scenarios. 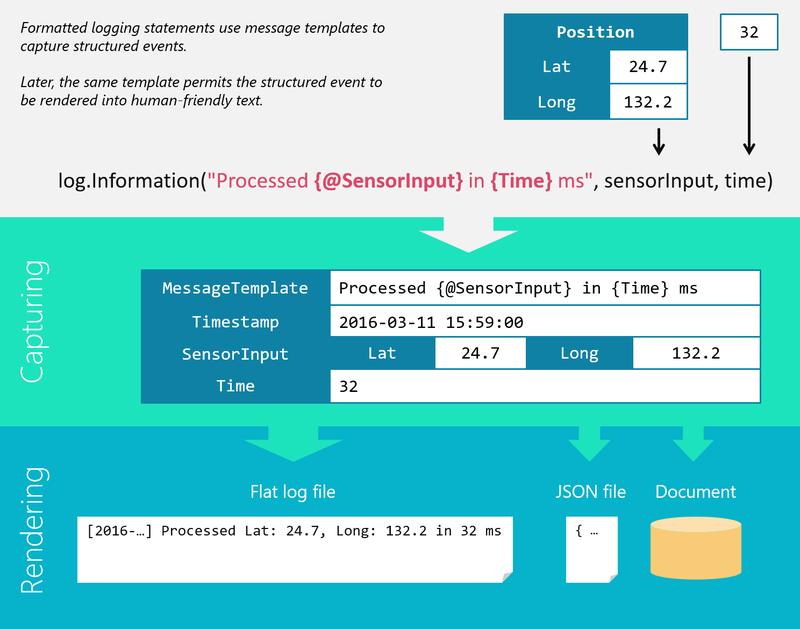 At various times, alternatives to text logs have been proposed under the banner of structured logging, which considers log data to be a stream of fully-structured events with key/value properties. Structured log events are much easier to work with in large, complex and distributed applications, because relevant events can be identified using queries over their properties, rather than by regular expressions over a text payload. JSON is used as an example rendering here, but the concept is not tied to a particular representation. This greatly improves machine-readability, enabling queries like username = 'alice' on the raw log stream, but the event itself is not human-friendly. Log events recorded in prose make full use of our language processing and pattern recognition abilities to ease cognition. A long stream of key/value pairs is painful to visually process. Compare the representative output of the two examples above to experience this effect - what’s happening in the second event? 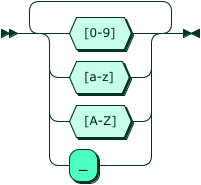 In principle, this technique benefits from greater readability, but in practice the looseness of the format causes ambiguities when parsing, and inconsistent usage within development teams. Ambiguities arise when a property inserted into the event contains embedded spaces and/or = characters. The lack of a defined grammar (and lack of awareness of the grammar in the logging tool) means developers have no opportunity to validate their use of the syntax – breaking the convention is easy and goes unnoticed. Finally, niche logging systems like Event Tracing for Windows have taken a middle ground, combining event ids in the log event with a manifest of format specifiers describing how a particular event can be rendered as text. Despite the near-perfect balance of performance, human-friendliness and machine-readability, the effort associated with assigning event ids and managing manifests have an impact on development-time ergonomics that limit the appeal of this system. All of these issues and shortcomings have kept fully-structured logging from reaching widespread adoption, but the need for it has continued to grow. Message templates take the best of all these approaches to provide optimal human-friendliness, perfect machine-readability and excellent development-time ergonomics. Message templates are unique in that they provide a means of capturing the event, as well as a means of rendering it into human-friendly text. An event captured using a message template is not immediately rendered into text unless it is being displayed directly to a user. Instead, the template itself is captured, along with property values for each argument. This is stored in an intermediate representation like JSON for processing. Because the template remains constant regardless of the actual property values substituted, it is possible to treat the template as an event type that identifies all events from the same template. In this example, log-ins from various users will carry the different username values, but the consistent message template shared by all of them means they can be retrieved as a group. A message template is a block of text with embedded holes that name a property to be captured and inserted into the text. The grammar below is maintained in the messagetemplates/grammar repository. A message template may be used to capture properties when provided a list of argument values. Each property in the message template is associated with exactly one value in the argument list. Given a set of property values, and a message template, implementations should render the template by substituting property values into the locations of the corresponding named holes. The following logging libraries have support for message templates. Library missing from this list? Let us know so that we can add it.